Just like the protagonist. Strange, dark and all over the place. A tormented philosophy professor (Joaquin Phoenix – Walk The Line) finds a will to live when he commits an existential act. “All we do is talk, talk, talk”. I should have known what to expect from an Allen flick. The guy loves to talk. 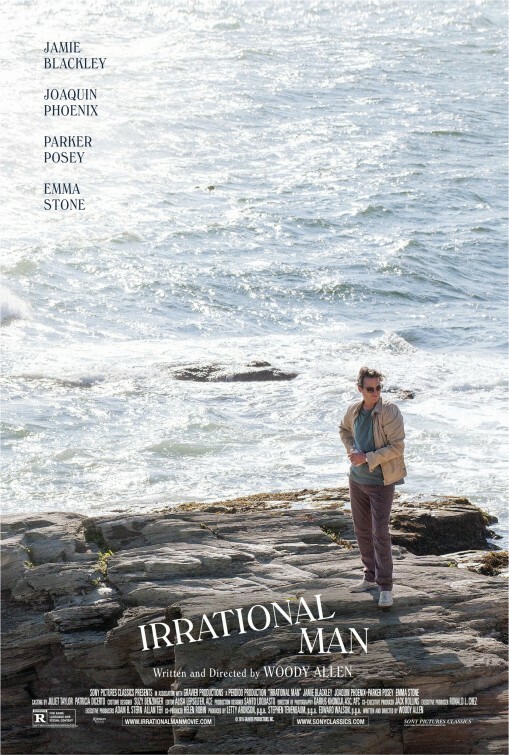 After watching Irrational Man, I’ve finally accepted that I’m NOT the biggest Woody Allen fan. BUT at least it featured one of Phoenix’s best performances. The mind numbing opening didn’t really build my hopes up with Phoenix’s troubled Abe waffling on about morality and aesthetics. I felt like I was sitting in a philosophical lecture. Yikes. The premise was hardly original. A radical professor shakes up the quiet life of a high school academic achiever. The first act trundled along at an easygoing pace with the predictable and nauseating romance blossoming between Emma Stone (The Help) and Phoenix. The pair had good chemistry BUT somehow Stone just grated against me. Her role nothing more than an audition to be the next Diane Keaton. Strong willed and independent in one frame. Annoying and a chatterbox, the next. 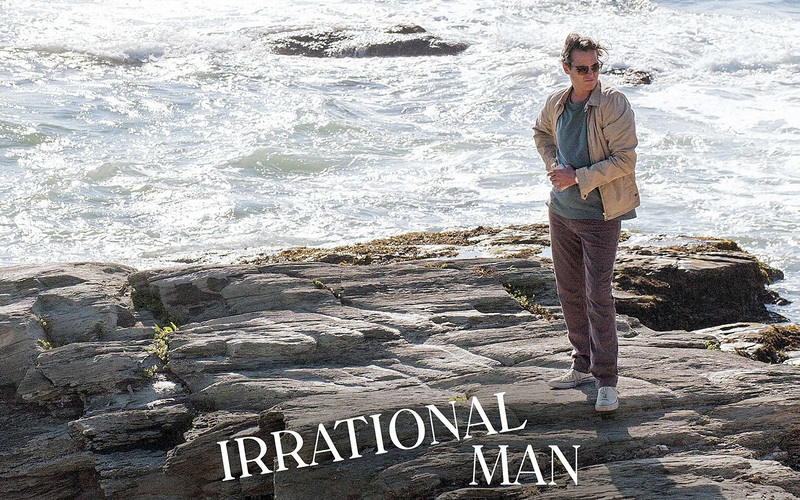 You couldn’t find a better choice for an irrational man than Joaquin Phoenix. He really did carry the piece. There were moments to be had as he tried to avoid the flirtatious advances of his work colleague (played brilliantly by Parker Posey – Superman Returns). He even churned out some quick witted one liners; referring to his own philosophical theories as “verbal masturbation”. His path to destruction made for engaging viewing. A man truly on the brink. Teaching his students a lesson in existentialism with a loaded gun and a game of Russian roulette. BUT it was all a little too slow and pretentious for my liking. Listening to Phoenix’s philosophical ramblings and watching Stone inevitably fall for him while bleating on to her long suffering boyfriend (Jamie Blackley – If I Stay) really did test me. However, my interest was finally peaked when the film went in a completely different direction. A change in tone and Abe’s character transformed a typical Allen rom-com into a black comedy. My griping was soon put on hold as Abe set out on a moral crusade to punish a judge after overhearing a custody battle conversation at a diner. Random, strange BUT intriguing. A slow burning stake out unfolded as Abe contemplated seeking justice on the small town judge. The dark thoughts turning into actions as our irrational man tries to rationalize this insane situation and the aftermath that inevitably followed. The only problem was that, despite this much needed change in pace and tone, it was all a little mismatched. Too light and easygoing to be taken seriously. And even when things finally took a darker turn with Abe’s crusade and demented new lease on life, the end result was flat and didn’t really deliver after all the promise. I could appreciate the irony of it all BUT it was all over the place. A watchable mess. It didn’t help that the leads’ chemistry wasn’t strong enough for me to care by the finale. Shame. A sterling turn from Phoenix and a strange premise did enough to keep me watching BUT I won’t be taking this class again any time soon. Not the best for me. Two stars for the two couples. James Marsden (X Men), Michelle Monaghan (True Detective) and their “younger” counterparts do their best to uplift an incredibly tame and cheesy love story but . . . alas! To no avail. Another film to be adapted from another Nicholas Sparks novel and hopefully the last. A little harsh but if they are NOT going to try and do something different than why bother? The Notebook and even the one with that couple that I can’t remember were so much better. Oh hang on, Endless Love. It didn’t help that I had quips about Luke Bracey (G.I.Joe: Retaliation). Now despite being the same age as myself or I (Never get that right), he looked considerably older than Liana Liberato (If I Stay) AND James Marsden. Bracey is supposed to be a younger Marsden. NOW Bracey is 6 foot something while James Marsden is a good head shorter. I know you shrink when you get older but come on! That’s when you’re in your 70s/80s not 40s. Even Liberato beared some similarities to Monaghan. Anyway, rant over . . . On that little quip. Liberato and Bracey have good chemistry as do their future counterparts M&M. BUT it’s all so dreadfully corny, predictable and at a whopping 132 minutes, I expected a little bit more drama to justify the length. It’s certainly watchable. And I guess it helps to be part of a couple not a miserable cynic like yours truly. BUT after the nicey nicey opening hour with all the luvvy duvvy guff, I found myself looking at my watch. Liberato and Bracey will certainly be ones to watch for the future and making waves in the right places. Sean Bridgers was delightfully sinister as Dawson’s (Bracey/Marsden) redneck father Tommy Cole and brought in a darker undertone and the much needed drama I seeked. He will certainly survive from this film relatively unscathed and made a memorable turn. But with that blasted 12A certificate hovering over this story, I knew the story couldn’t go as far as you could have. A shame. BUT that’s not to say there were wasn’t some unexpected twists. Predicted but considering the fluffy tone that this film first portrayed, it was still unexpected without spoiling the film for those who are still tempted to give it a go. The closing moments also fitted that heading appropriately. Dreadfully predictable but, none the less, grab your tissues if you’re one for the weepies. Now I admit, I have had a teary eye in the odd rom drom BUT this made me cry for all the wrong reasons. It’s not all bad. Certainly watchable but there have been so many couple movies out this year worth seeing. I enjoyed Love, Rosie a lot more by comparison. This was lazy, slow and ended so predictably that I’m not surprised that it’s leaving the box office quicker than it entered. There are some endearing moments, especially with the couples’ relationship with Gerald McRaney’s (Jericho) Tuck. McRaney was brilliant and really did justice to a character that shouldn’t have been as memorable. He also works well with Bracey which made their relationship a little more likeable. I haven’t read the novel so I cannot say whether the film has done it justice. BUT one thing, it most certainly hasn’t spurred me on to read it. The cast do their best to uplift what really is a Sunday matinee TV movie that you’d expect to see on True Movies. It’s watchable BUT I ‘d already forgotten it as soon as I left the cinema. I should have stayed at home is . . . what I thought I would be saying after watching this. But surprisingly this . . . uh . . . surprised me. The corny coma chick flick meets the cantankerous cynic of a critic and for all my griping (which there may be a smidgeon), there is still beneath its cheesy surface; an easygoing and brilliantly acted drama. I can feel the man points dropping off but here we go. So what’s it all about? Life changes in an instant for young Mia Hall (Chloe Grace Moretz) after a car accident puts her in a coma. During an out-of-body experience, she must decide whether to wake up and live a life far different than she had imagined. From the trailers and weepy teenage girls with their tissue boxes at the ready, I feared an incredibly schmaltzy, corny OTT teen love story. To an extent, it is. But I was proven wrong before with The Fault In Our Stars. 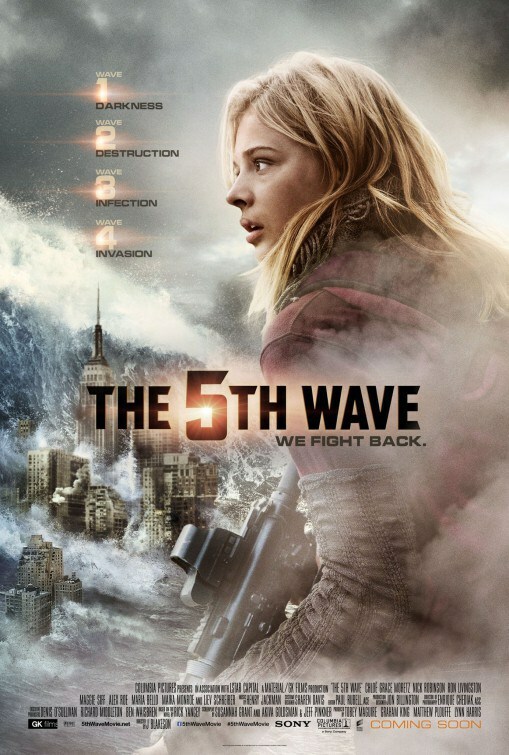 Chloe Grace Moretz has matured from Hit Girl and impresses yet again, proving that she can handle the lead role. The cast are perfectly chosen. Mirielle Enos (The Killing USA) and Joshua Leonard (Men Of Honor) play the hard rock junkie super cool parents fantastically to Moretz’s inevitably stuffy, uptight cello playing Mia. That is until she meets Jamie Blackley (Snow White and the Huntsman)’s charismatic Adam and the rest is . 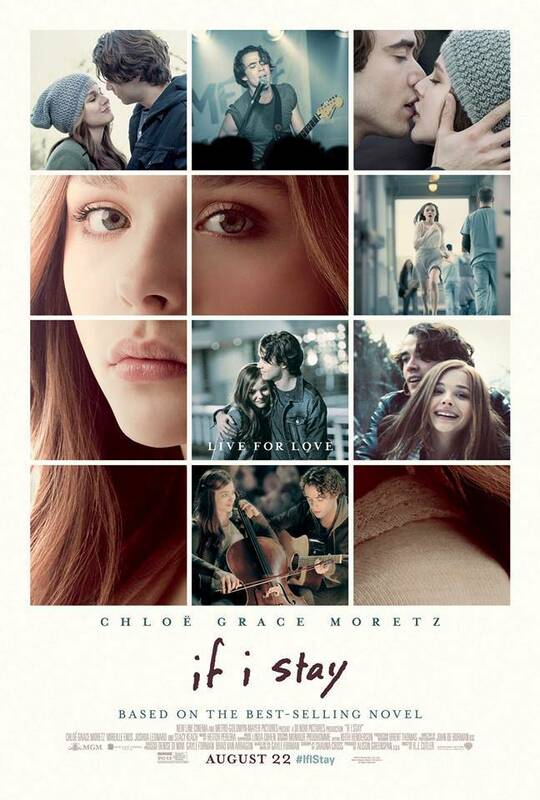 . . the movie of love, loss and classical music. Blackley and Moretz have fantastic chemistry together and they really do make the characters stand out. I actually found myself caring for the little love birds not praying for their demise. Of course, they go through the ups and downs; the why me when you’re so cool and I’m so geeky spiel. The tests of college and flying the coop. Check, check, check. That is until the accident. That happens early on and the story flashes back and forth. To be honest, the coma angle of the story didn’t really do much for me. The flicking back and forth just disrupted what was an easy going and watchable boy meets girl love story. It was just CGM wandering around aimlessly bar a few twists (which were ruined in the trailers). The last 15 minutes or so in which CGM finally stands still and listens to her friends and family as they prepare themselves for the worst case scenario, finally justifies itself by allowing for some endearing scenes (and yes everyone was crying. Apart from me, obviously). Without spoiling too much, I couldn’t help but question the relevance of Aisha Hinds’ (Under the Dome) Nurse Ramirez preaching motivational speeches to a comatose patient. Ridiculously corny. Plus was she a spirit? As no one seemed to be paying attention to her too. Pointless in my opinion. Liano Liberto plays Mia’s best friend well and Stacey Keach delivers an emotionally sobering performance as Mia’s grief stricken grandfather. The cello playing by whoever was CGM’s stand in was impeccable and the amount of classical music that was played in this. Unexpected but brilliant. Made a change to the usual indie/pop/teen soundtrack these films are normally flogging. The ending is a bit abrupt. It’s all built up and ponders the question which the film heavily suggests and then just ends. The problem with these sort of coma pics; there are only ever two outcomes which makes it all a little predictable without divulging too much. I was surprised at how quick this film disappeared from my cinema. It’s not without its imperfections but I have seen a lot worse. If it is still lingering around, give it a go. It won’t win merits for originality but cheesy, easy going, watchable guff all the same. 2.5/5 for me (might change it to a 3) depending on the next influx of weepies which there inevitably will be.